Born 1939 in Tokyo, Masabumi Kikuchi played with Lionel Hampton and Sonny Rollins while still a teenager, and made his recording debut in the early 1960s with Toshiko Akiyoshi and Charlie Mariano. In the 1970s he collaborated with Gil Evans and Elvin Jones and led his own groups, in both acoustic and electric modes, variously drawing influence from Miles Davis and Stockhausen, from Duke Ellington and Ligeti and Takemitsu. Kikuchi was amongst a small group of musicians with whom Miles Davis would confer in his post-Agharta retirement period, and he contributed to a still-unissued session with Miles, Larry Coryell and others, in 1978. 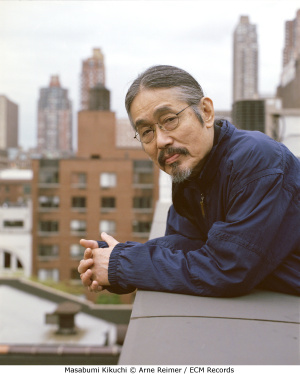 Several of Kikuchi’s 1980s recordings were devoted to the synthesizer, but by the 1990s he was again emphasizing acoustic piano, founding the group Tethered Moon with Gary Peacock and Paul Motian. Motian, in particular, encouraged Kikuchi’s experimental tendencies, and was pleased to feature Masabumi Kikuchi in his own groups. The release of Sunrise in 2012 provided a context for Kikuchi to play in Japan again, where the music of Black Orpheus was recorded in October of that year, in the responsive acoustics of the Tokyo Bunka Kaikan Recital Hall, a space originally designed for chamber music. 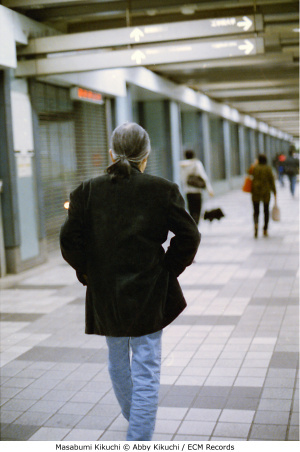 Back in his New York loft, a home base since the 1970s, Masabumi Kikuchi continued to work on the music. He withdrew from public performance but, with ECM’s support, made numerous recordings at home, both of solo piano meditations and group improvisations with a circle of younger associates including Thomas Morgan, guitarist Todd Neufeld, and saxophonist Michaël Attias, who helped him in the quest for new shapes and forms in spontaneous music-making. He died on July 6, 2015.